Excerpts from Sutherland Centennial, 1891-1991. George C. White was born in Lightstreet, Pennsylvania on November 28, 1868, a son of William P. and Rebecca Kremling White, both of whom were born in Pennsylvania, his father’s birthplace being Columbia County. His parents owned their own land and their business was farming. Leaving home after acquiring a common school education and a knowledge of farm work, George C. White went first to Ohio and later to Redfield, South Dakota, finding employment in both states as a farm hand. 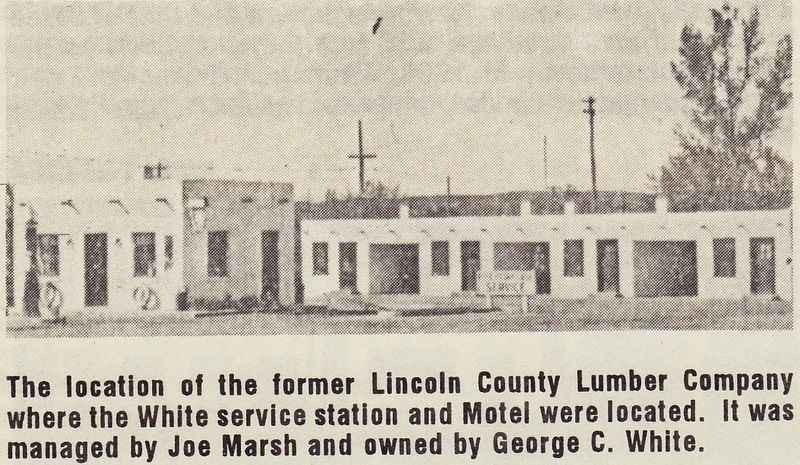 In 1890 he came to North Platte, Nebraska, and was a clerk in a grocery store owned by F.C. Bewick for two years, leaving that place to come to Sutherland in 1892. Here he embarked in a mercantile business of his own and conducted it until 1907, when he sold out to Walter and Ed Coker. 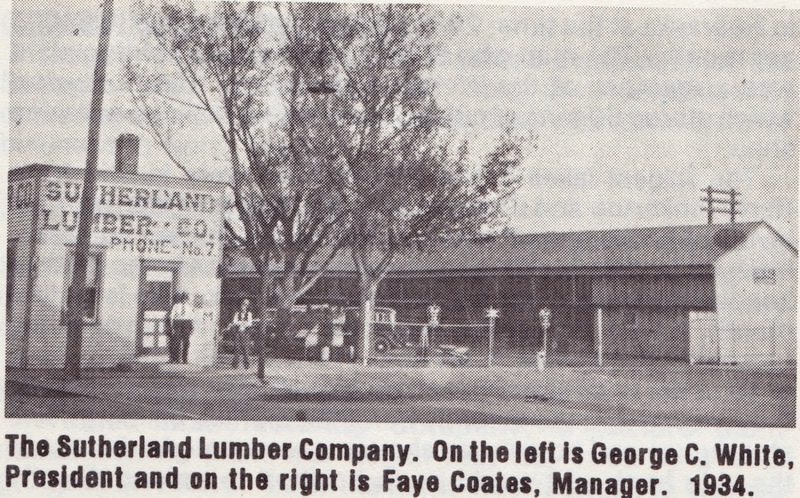 Mr. White was president of the Bliss-White Lumber and Hardware Company, Hillsdale, Wyoming, the Sutherland Lumber Company, the North Platte Artificial Ice and Cold Storage Company, secretary-treasurer of the Keith and Lincoln County Irrigation District, and was secretary-treasurer and principal owner of the Sutherland Telephone Company. He also owned an apartment building in Omaha, Nebraska. After selling the telephone company, he invested along with Walter Coker, Nate Trego, John Goedert and R.A. Scott in the Farmers State Bank. The bank operated until the depression years, when it became insolvent and was forced to be liquidated. 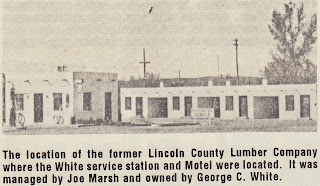 In the early thirties, he bought the Lincoln County Lumber Company, dismantled the buildings, built the White Motor Lodge and established the White Oil company on the corner across from the railroad crossing. He owned land in Colorado, Wyoming and also quite a few parcels in Nebraska mainly in Lincoln County. In 1892, Mr. White was united in marriage with Elizabeth Hawley, who was born in Chester, Pennsylvania on August 8, 1875, daughter of John Hawley, an early settler in Lincoln County, Nebraska. 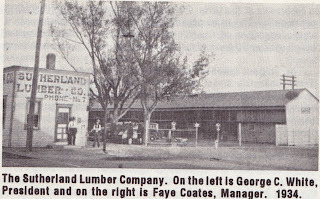 Mr. and Mrs. White became the parents of four children: Alvin, who remained at home; John, who managed the lumber yard in Hillsdale, Wyoming; Myra, who attended Rockford College at Rockford, Illinois and married Joseph Marsh and later moved to Florida and entered the construction business; and Conner, who remained in the Sutherland and North Platte area. 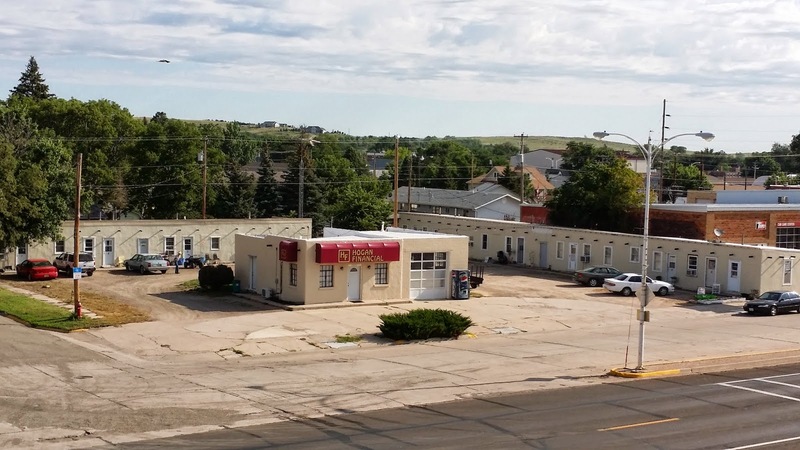 The White Motel today - affordable residential apartments and an insurance office. Mr. White made many contributions to the Sutherland community and had a great deal of civic pride. He was a member of the Modern Woodmen of America and the Independent Order of Oddfellows. George C. White died March 8, 1943. His wife, Elizabeth, died July 5, 1959. They are both buried in the North Platte cemetery. Alvin P. White, the oldest son of George C. and Elizabeth J. White, was born August 24, 1894. At 13 years of age, while still in school, he developed rheumatic arthritis and became crippled. He continued to take his school work by correspondence and graduated from high school. He continued with his education at the University of Chicago and received his degree in Law. He did not practice law on his own as it was impossible for him to move around. My father had to literally carry him in a car to move him back and forth to where he had to go. He became a partner in a law firm in North Platte and later a police judge and Justice of the Peace during the prohibition years. Law enforcement officers connected with the prohibition act would come into the law office and swear out warrants for various people who operated illegal sales in the manufacture of whiskey. In 1926, he spent a year at the Mayo Clinic in Rochester, Minnesota where he underwent a series of operations to enable him to walk again. When he came home he did walk a mile in our big brick house in Sutherland on crutches. He contracted a cold during the election of Herbert Hoover and he died on December 5, 1928.